Coachmen’s Clipper Classic series is its line that consists of time-tested favorites. 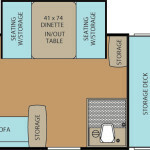 This series is made up of just a handful of different floor plans, all of which are fairly compact, and three of which include only a single pop-out tent section. 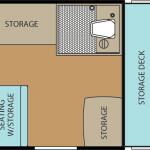 For campers who are looking for a little bit more, the Classic 1285ST includes two pop-out king beds and a slide-out dinette, which creates a lot more interior living space. 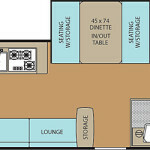 Each floor plan includes a dinette, and two also include additional seating in the form of a sofa or lounge. Three of the models also include cassette toilets. 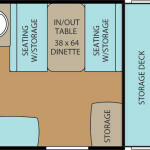 Clipper Classic 1285SST floor plan. Courtesy Coachmen RV.